This book is nothing less than stunning. 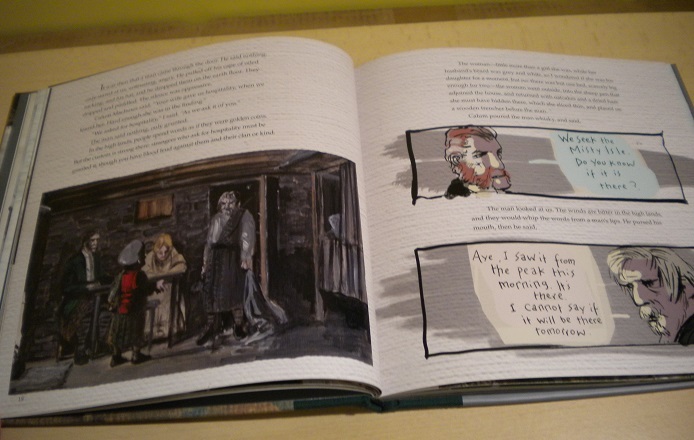 Gaiman’s wonderfully dark story is equalled and enhanced by the amazingly atmospheric illustrations of Eddie Campbell. The two elements – words and pictures – are completely entwined. There’s no feeling of the one being an addition to the other – each is essential and together they form something magical. 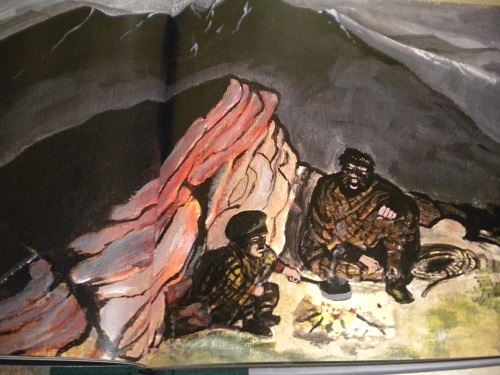 The story is by turns moving, mystical, dramatic, frightening; and the illustrations, many of them done in very dark colours, create a sense of mirky gloom and growing apprehension. To avoid spoilers the pages I have shown are all from the beginning of the book, but as the story darkens, some of the later pictures are truly macabre and unforgettable. I am old now, or at least, I am no longer young, and everything I see reminds me of something else I’ve seen, such that I see nothing for the first time. A bonny girl, her hair fiery-red, reminds me only of another hundred such lasses, and their mothers, and what they were as they grew, and what they looked like when they died. It is the curse of age, that all things are reflections of other things. 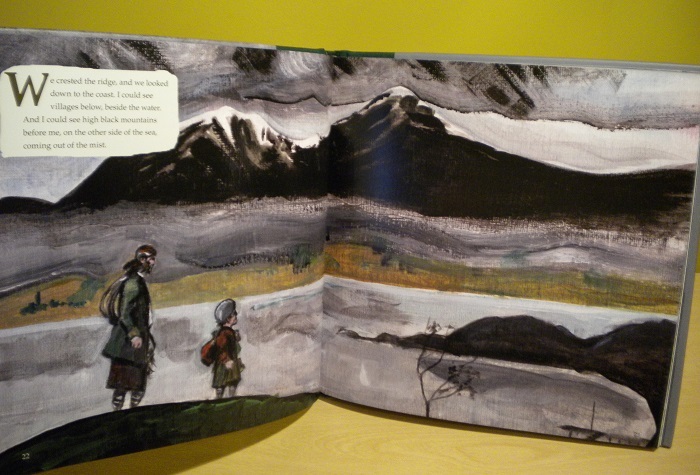 Gaiman was apparently inspired to write the story by his visits to the Isle of Skye and the legends of the Hebrides. 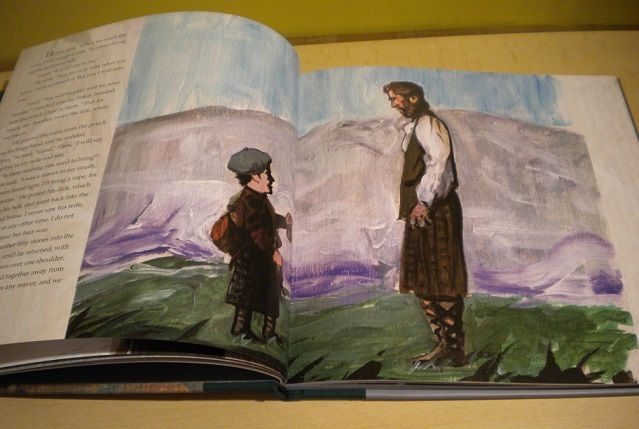 While the pictures quite clearly place the story in the Highlands – the kilts, the purples and greens, the blackness of the mountains – Gaiman has very wisely steered clear of any attempt to ‘do’ dialect. 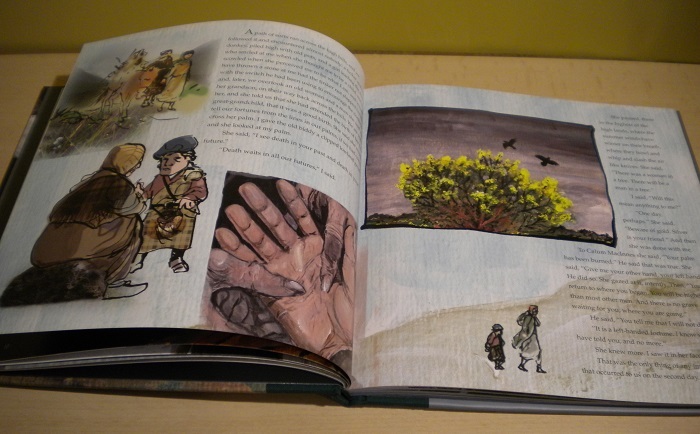 The book is written in standard English, but with the lush layering of traditional legends and with a rhythm in the words that really calls for it to be read aloud. Perhaps this isn’t surprising since the story was originally devised to be read by Gaiman himself at the Sydney Opera House with Campbell’s illustrations projected as a backdrop. I was the lucky, lucky recipient of a hardback copy of the book, but apparently the Kindle Fire edition has audio and video links, though to what I don’t know. However, the book is so beautiful that, devoted though I am to my Kindle, this is one where I would strongly recommend the paper version. All the way through, the story is foreshadowing the eventual end as if to suggest that all things are fore-ordained. It’s well worth reading the book twice in fact (it’s only 73 pages) – the first reading has all the tension of not knowing how it ends, while the second reading allows the reader to see how carefully Gaiman fits everything together to create the folk-tale feeling of inevitability. And then read it again a third time, just because it’s wonderful. I end where I began – stunning! NB This book was provided for review by the publisher, Headline. Your review convinced me. Though this book is rather costly, it is now on its way to me. We will see if it is as good as you say. Well you know I loved this – you steered me towards it, and I am as smitten as you. So – go Wordman, go Margot, this is truly a thing of delight. I particularly like how (in the real book, as I’m sure it couldn’t happen on an ereader) you can see the texture/weave of the artist’s paper, like wonderful hand crafted old writing paper/linen weave, and the way the wash of colour is variable across the texture of that, even though of course the pages in the printed book are gorgeously glossy. So glad you enjoyed it too – sometimes a book is so special it can make even the warring Valkyries since a temporary truce, eh? 😉 Yes, the ‘texture’ is lovely and I love the way you can see every brush stroke too, and the shading of the colours. I tried to wangle a Kindle copy too just to see what it looked like on the Fire, but I was out of luck I’m afraid. I reckon one day they’ll start selling both together – the way they now do with music, where if you buy a CD they ‘give’ you the MP3 version too. That way, the reader could have the benefit of both. PS Am I alone and consistently mis-reading Headlice for Headline? Thanks for re-affirming my deepest, darkest fears Professor. Scratches head sadly and anxiously. Or shave your hair off. Lovely review! I really like pictures in books, I must admit. And the dark side of this book is very appealing. Does it have a treacherous (or shocking) end? Oh no! Can’t do that. I’m almost done with Martian. 1 to 2 chapters left! What’s next on my TBR, by the way? Well, I’ve had a look at your list and I’m not sure if you’d really enjoy any of them – but we could do a joint read of Gods of Mars…or you could read Allan Quatermain. But did you finish Divergent? There’s three of them… No!! I know!! HP!! He hates me. Ever since I set him on fire. No, I quit Divergent. Talk about a girls book! *gags a few times* I’m reading Bleak House. Starting very strongly on that. Gods Of Mars…sounds cool… Never HP! *laughing* Well, you can kinda see his point, though! Yes…I suppose. But he must be evil. You’re right! Any man who goes about sneaking down people’s chimneys and stealing their cookies really isn’t trustworthy. Well…I probably wouldn’t have put it quite like that but…well…yes! Though it’s very unfair of me since I haven’t read the books, but I have read a million reviews of them and the overall impression I’ve gained could be summed up as dadblamed yuckery! He also takes milk. And he leaves soot everywhere. Someone should set a bear trap or something. They can’t be compared! Did you know that HP once tamed a Hippogriff and flew it? He never comes to my house anymore, sadly. You must do it! *laughing* You’ve got to be kidding me! I do wonder about all these dadblame names. Is that a hippo? I believe you probably don’t, but still, thank you! What’s Hogwarts? No it’s a…well…it’s sorta like…er…nope, you’ll just have to read the book! I do too!! The Hogwarts School of Witchcraft and Wizardry where all the young people are taught magic and stuff. Did you know the school is in Scotland? In a castle? Well, the professor has one, but it’s skinny. Perhaps you should let him in the door. *laughs* Somebody should shoot missiles at it! Ah, but some of the greatest wizards of all time have cast protection spells over it – so unless you learn some of the spells yourself you’d never be able to attack it. Petrificus Totalus! *laughing* But the eventual stench! And did you ever notice how Santa never has any nice toys? I wish I had a spell… Hey! A professorish spell…that’s cool. *laughing* I’d have preferred not to think about the stench frankly! That’s probably because he gave all the nice stuff to good little Professors. It’d be in my chimney, dadblameit! I’ll leave the killing to the polar bears. My favorite would probably be the pale orc guy. You have polar bears in your chimney? Cool! That’s what they call him? The main bad guy is Dobby? Goodness. Looks beautiful! I’ve read a few Gaiman novels, but they always say that he’s best when there are pictures. I’m very new to him – I’ve only read a couple of his short stories and this is the first of his graphic novels I’ve seen. But if this is his usual standard, it certainly won’t be the last! So far, I’ve read only one of Gaiman’s books and I thoroughly enjoyed it. I loved your review – felt like I was there listening to the story. Scotland provides a great many good stories. I’ve only recently started reading Gaiman and have loved him. This sounds just like him and as though you enjoyed it very much. Thanks for sharing. Ok, ok – I give in. I’ll have to buy this one. I’m so glad you are enjoying Gaiman. I’ve been a fan for umpty years. Great review. Wow. Your review has pulled me in. I’ve got to find this one! I do like a book that deserves a rereading purely to add another dimension to the tale. My son is really into Neil Gaiman but I have to confess I’ve never read one… he was interested in your review which is why I pressed reply after only writing one sentence duh! What a strange little book—sounds enticing. Although I already own this story twice over (it’s anthologized in both Stories and Trigger Warning), I’m considering buying this edition for that gorgeous artwork. I love it when words and pictures work together so well; sadly, I’ve seen a few books where that isn’t the case. But you’re right: this one looks stunning! I saw the thumbnail for this post in your side column and was reminded that I have now read this. This story still gives me the shivers. It’s brutal and, yes, so well-crafted as to be near perfect. I have read many of Neil Gaiman books, both adult and children’s books, as well as his graphic novels. He’s a master story teller. I checked out the book, The Trutj is a Cave in the Black Mountins, and audiobook (read by Neil Gaiman) from my library. I have listened to the book as I turned the pages 3 times so far. I ordered a used copy of the book from Abebooks for $3.48 so I’ll have my own hard copy, once I return the library copies. BTW, Neil Gaiman read this book as pictures were flashed on the screen at the Sydney Opera House. You should also read Stardust and then watch the movie with Robert DeNiro and Michelle Pfeifer. Gaiman’s book The Graveyard Book is also a delight; again I checked out the audiobook and the hard copy from my library and “read” them simultaneously. The Graveyard Book won a Newberry Award in 2009 – quite lovely!